Quebec city lies on the coast of the large St-Lawrence river. The city is the capital of the Province of Quebec and is home to one of the largest French speaking populations outside of France. The Plains were once the location for the battle between the British and the French for control of Canada. General Wolfe attacked Montcalm in 1759 and won the area for the British. Even though one would think the area would become more Anglicised over time, this is not the case and to this day remains distinctly French. The Plains of Abraham are now a lively park in summer with people congregating to take part in various cultural, sporting and relaxing activities. The fortifications are home to the Governor-General of Canada. The Citadelle still houses a garrison, the Vandoos, who perform the Changing of the Guard on a daily basis in the summer. Ask at a local information point for exact times of opening and performances. Within the stone walls built by the French in the 17th century, lies Vieux-Quebec. The buildings are still in excellent condition evidencing old architecture. You'll find museums, shops, cafes and restaurants in the old town. Chateau Frontenac is the best known hotel in Quebec city. The hotel overlooks the St-Lawrence river down below. There are excellent views of the river valley from the Promenade des Governeurs next to the hotel. Ile d'Orleans is close to the city and is a good place to walk amongst tiny lakes and see houses and churches from days gone by. If you happen to be in Ile D'Orleans in June, make sure you taste some of the islands' famous strawberries. The church dates back to the late 17th century. You can tour the church and visit the crypt where all past Bishops of Quebec are buried. Parliament, together with the Assemblee Nationale, are home to the Governement du Quebec and worth a look to see the corridors of French-Canadian power. Tadoussac is only a 4 hour drive north from Quebec City along the St Lawrence. The best time to go whale watching in Tadoussac is from early summer to early fall. Ride through Vieux-Quebec on a horse drawn carriage or "Caleche" and be treated to the story of Quebec from your driver. The Quebec Winter Carnival takes place in February. As one would imagine, ice plays a major part in the carnival and ice sculpting, skating and dancing displays are on hand for revelers. Bring your hat, mitts and jacket, it's cold! Pack a picnic, a radio, a book, a ball and a Frisbee and enjoy the Plains of Abraham on a glorious summer day. The Cabane a Sucre is a uniquely Quebecois experience. Join a group on a tour of a maple tree forest and taste the freshest maple syrup in the world. Add to it Canadian bacon, ham, beans and ice and you have a Quebecois feast. The only and best time of the year to do this is in March when the maples are sapping. The maple tree has produced this internationally enjoyed sweet syrup to be added on your pancakes. When it's cold in winter, or you've enjoyed a heavy night on the town, a good hearty breakfast of eggs, bacon, beans, potatoes, toast and coffee will sort you out. Creton are also pretty good so don't be shy. A day out at a cabane a sucre in winter will teach you a bit about a traditional quebecois meal with Maple Syrup, Canadian Bacon, ham and of course, plenty of snow. It's a mince meat pie with onions in a pretty thick crust. Popular in winter, ketchup goes very well with it. Otherwise known as Shepherd's pie. This isn't for everyone but poutine is great. It's fries or chips, with cheese and chicken gravy. Fantastic. Feves au lard are good old beans and lard in a slightly smoked sauce. Quebec boasts a whole slew of excellent micro-breweries. Give the local stuff a taste but also enjoy the more commercial beers on offer. You can find excellent hotels in Quebec city. Many of the main hotel sites will have listings for you in Quebec City. 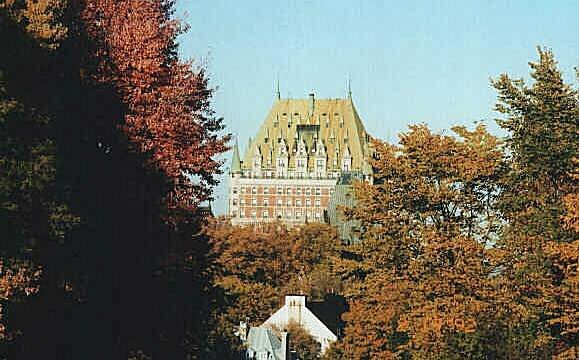 Find Quebec City Hotels. There are numerous lower budget lodging options in Quebec city. Search for and book hostels in Quebec City . Information on your arrival can be found at the Quebec Airport Site. Always the easiest way to get around, but the most expensive. Car rental is quite affordable, gas prices are decent and a great way to get around town. You can easily walk around the city, the old fortified town and the plains of Abraham. Walking is probably the best way to see the city. The Quebecois are very proud of their past. They love the history and ties their city and province has to France and French culture, but also it's relative independence from all things European. You'll find warm, friendly people in Quebec City, ready to show you a good time. Mostly French. You can get by with English but try to address locals in French at first. GMT -5, daylight savings time is observed.